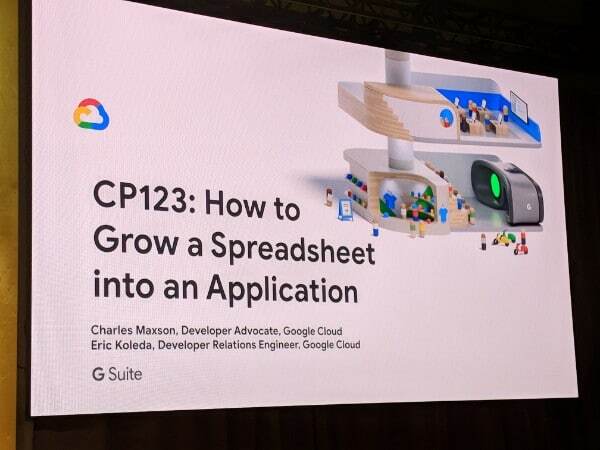 Really interesting talk about the life cycle of a spreadsheet, and how it grows into an application, and how you can move beyond the spreadsheet to a more robust, scalable solution. …and times when they don’t make good applications! A bunch of Data Studio enthusiasts and Googlers got together to discuss the product and the roadmap. Great to get some insight into where it’s going. 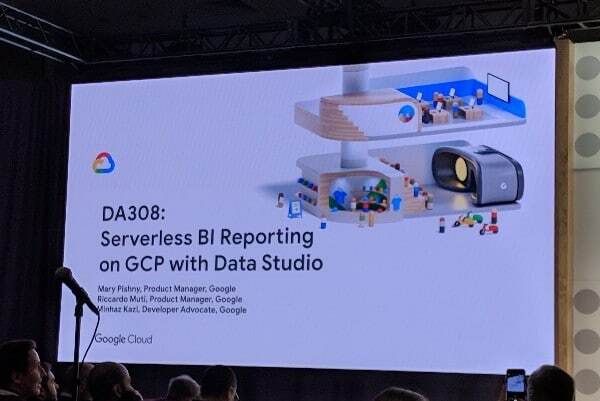 They’re certainly investing heavily in Data Studio! 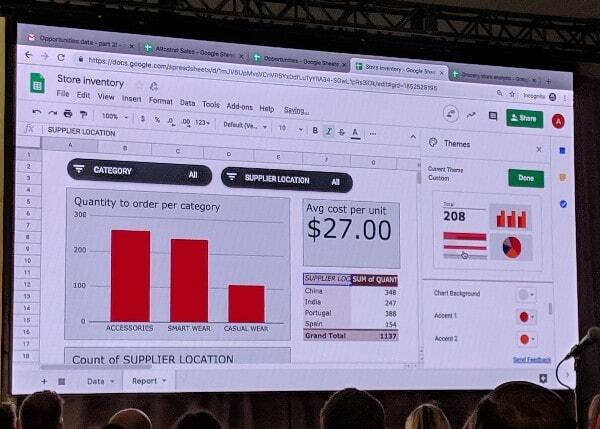 Some really interesting use-cases of businesses adopting G Suite, and how it’s simplifying and streamlining their processes. The team also shared some innovative and wide-ranging examples of App Maker apps. For example, here’s an App Maker app that can recognize text in a photo and transfer that into a Google Doc for you! Video replay of yesterday’s Sheets session! 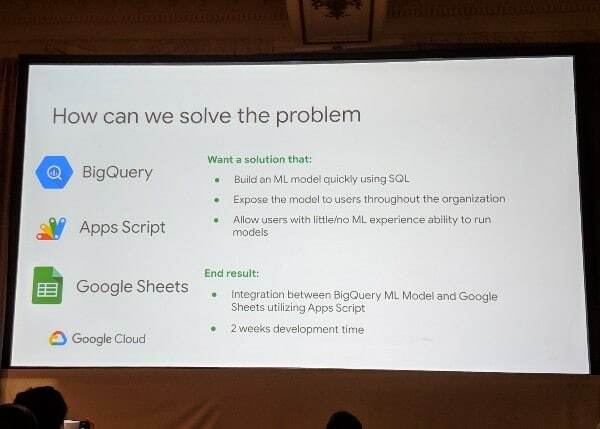 Lots of updates from the Data Studio team and a great demonstration of how quick the tool is to analyze a hundred million rows of data, when using the new BigQuery BI Engine between BigQuery and Data Studio. 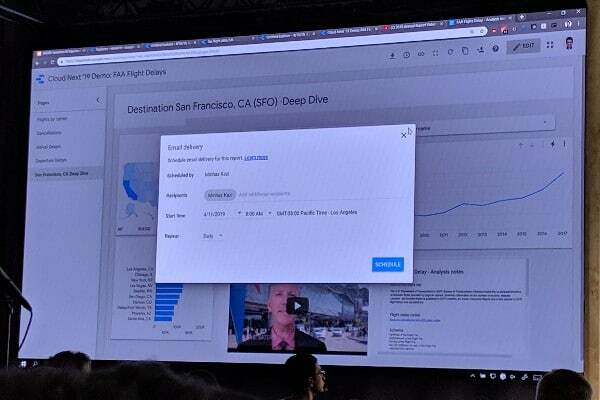 The other big updates included a sophisticated chart drill-down and cross-filtering features and more insight into the scheduled distribution of reports. It’s very clear that Google are investing heavily in this tool! 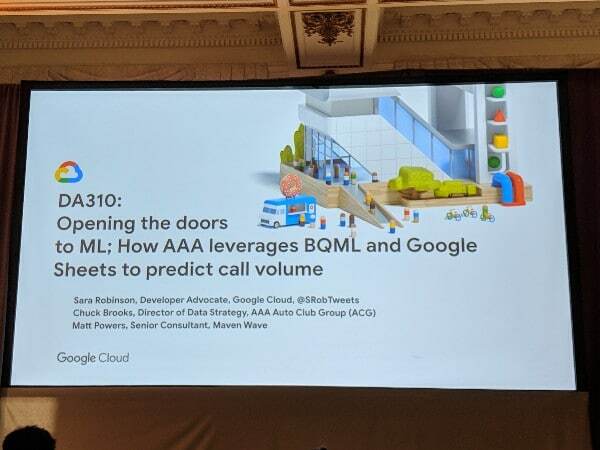 This was a really interesting session on how AAA utilize BigQuery and the new BigQuery ML (Machine Learning) tool to predict volume at call centers. 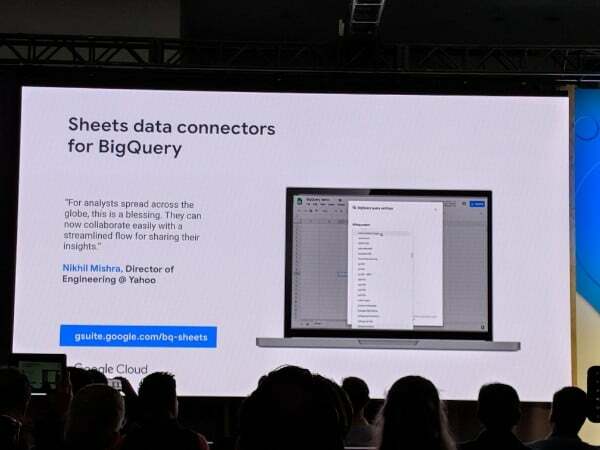 They use the BigQuery connector to bring the analytical capabilities into Sheets, to open access to the model to many more people across the organization. 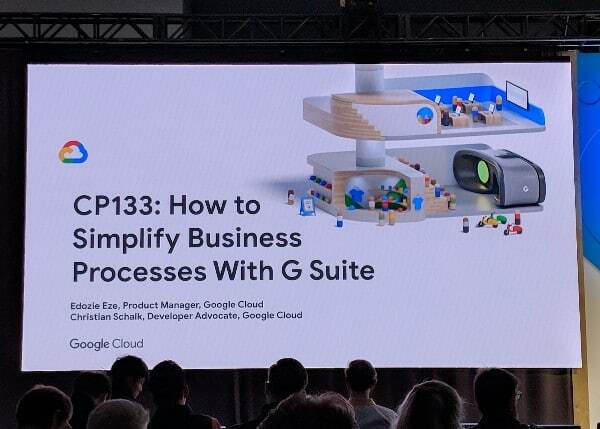 Good to see G Suite get a lot of stage time! 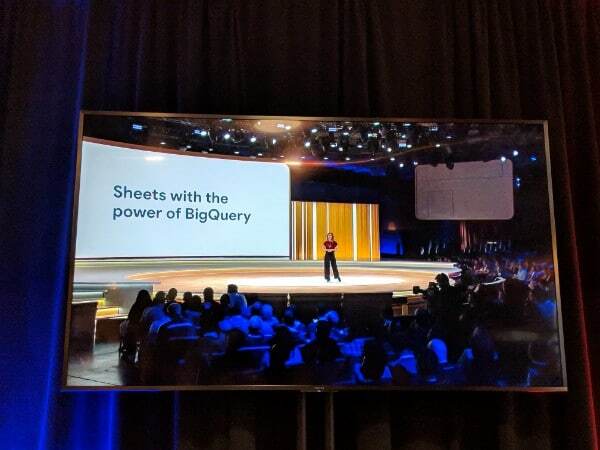 BigQuery + Google Sheets! This is exciting! Day 1 was all about enterprise, enterprise, enterprise. 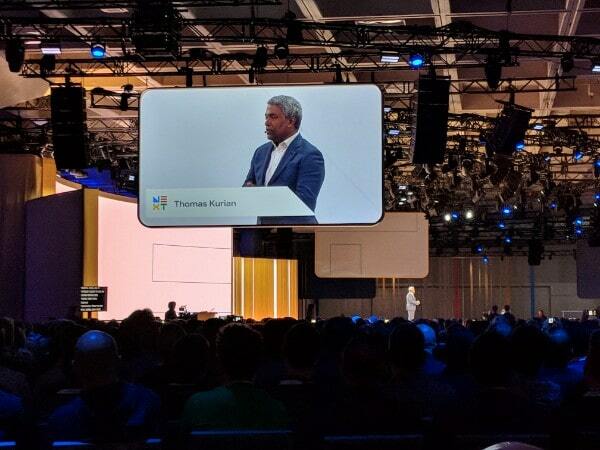 Google Cloud CEO, Thomas Kurian, announced a new product, Anthos, available for managing multi-cloud solutions. For me personally, this enterprise stuff is really interesting but not directly relevant. The highlight of the day was meeting a bunch of great folks and sharing ideas, beginning by serendipitously sitting next to a data scientist from MailChimp for the opening keynote. Tomorrow, the focus is more on product and developers! The scale of this conference is pretty overwhelming! 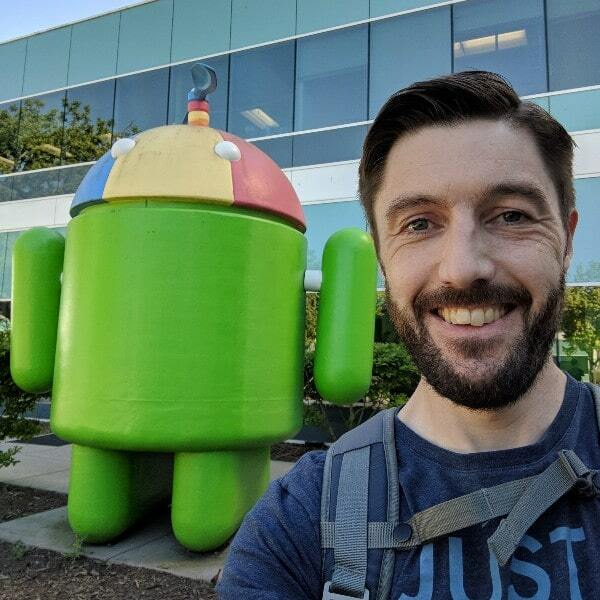 One of the benefits of becoming a Google Developer Expert is that I get to meet some of the Google Project Managers and give product feedback directly. This afternoon we had a big round table with most of the G Suite and Apps Script GDEs and the respective Product Managers and Developer Relations team from Google. 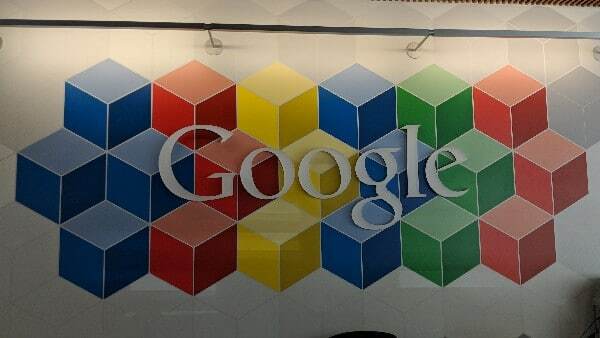 It was a lively discussion and great to see Google listening to all our feedback. There’s lots of exciting stuff in the pipeline, some of which will be announced at Next, some later this year. Unfortunately I can’t share any specifics now, but I’ll certainly share anything that gets announced at the sessions tomorrow! Interesting presentation, although totally different to what I expected. 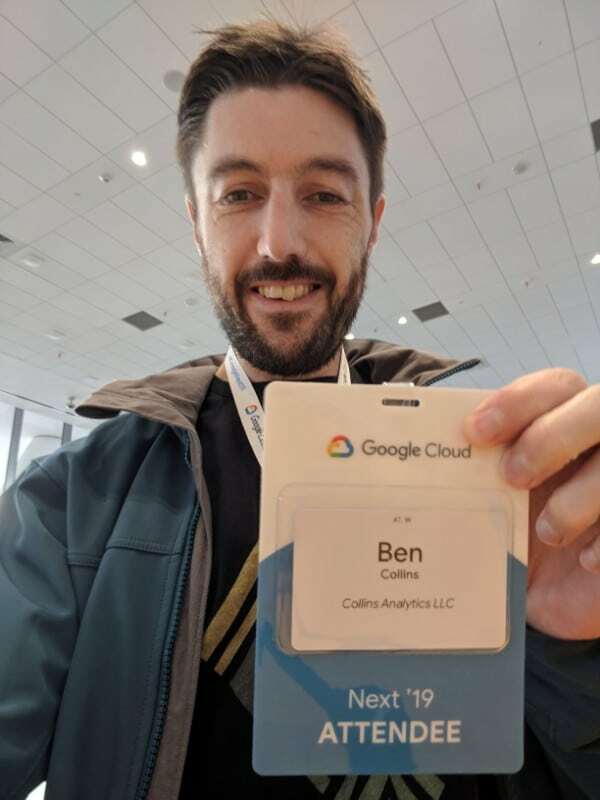 I was expecting more of an introduction to using BigQuery and how to approach it for product managers, analysts, managers etc. (i.e. non-engineers). 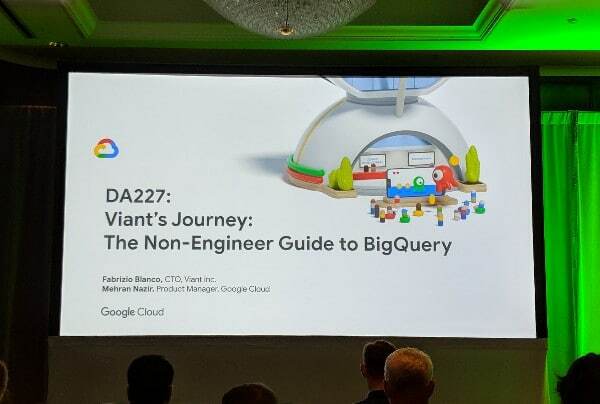 Instead it was an demonstration of a super cool tool Viant have built on top of BigQuery to democratize access to data across their organization. 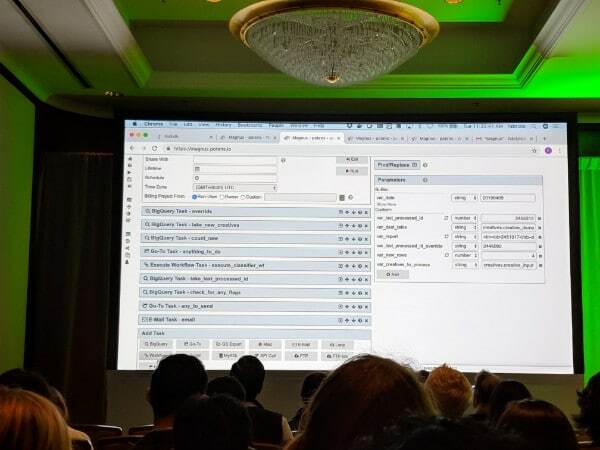 Their tool – potens.io – allows you to build workflows to query data in BigQuery including business logic, API integration and script outputs (like emails if certain results are obtained). Interesting stuff for sure! 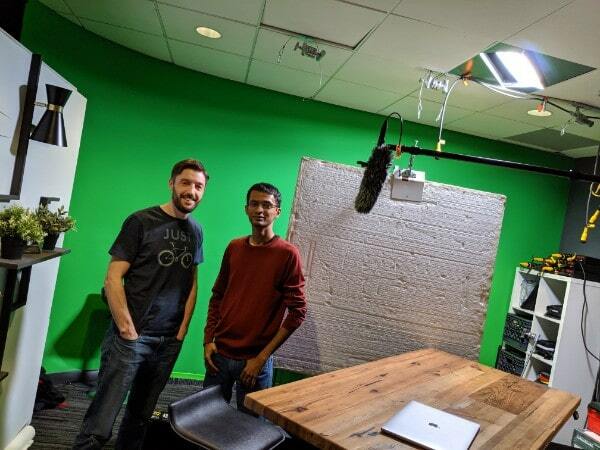 I look forward to diving into BigQuery (someday soon!) and start creating content here. I managed to get into the hall for the keynote this year. The sheer number of people filing in and out of the Moscone center was still overwhelming. 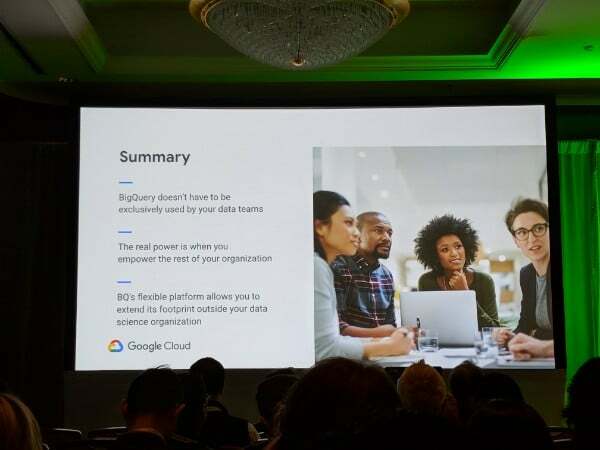 Sundar Pichai (CEO of Google) kicked things off before new Cloud CEO, Thomas Kurian, took over and laid out his vision for Google Cloud. 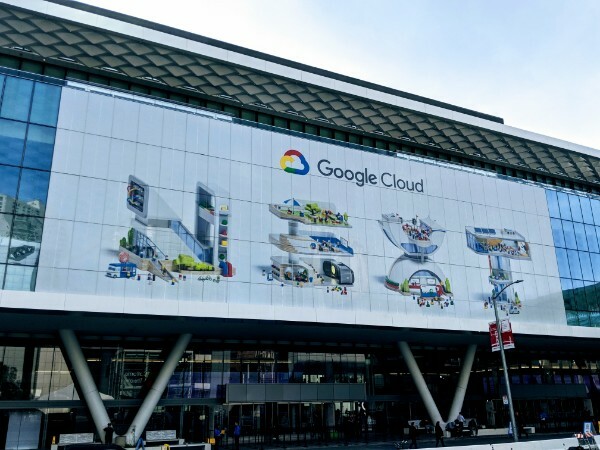 Unsurprisingly, and understandably given Google’s position in the cloud race behind Amazon and Microsoft, the focus was entirely on Enterprise solutions and multi-cloud solutions. 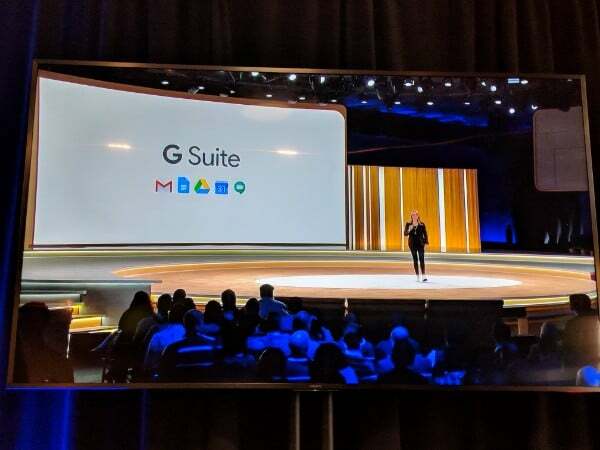 Not much mention of G Suite…yet. Tonight Google hosted a community dinner for the Google Developer Experts in their offices downtown. 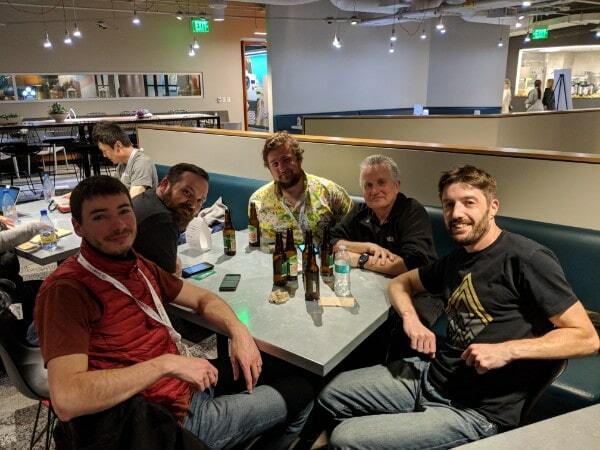 It was great to catch up with fellow Apps Script and G Suite GDEs and hear what everyone’s up to. Everyone is using the CLASP, the Command Line Apps Script interface, with their code editors of choice. This allows for a much improved development environment over the native Apps Script one. 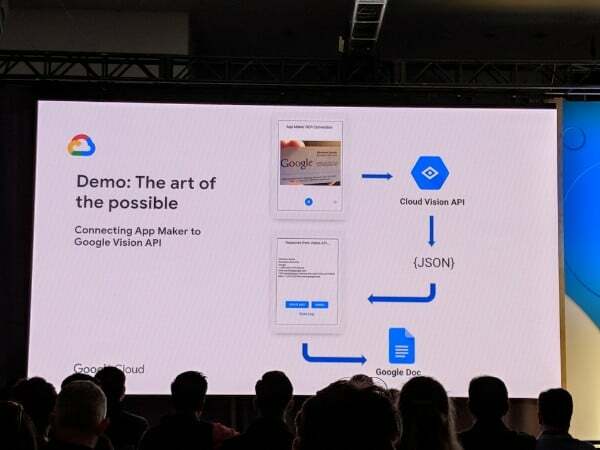 And we’re all waiting to see if there’s any vision on the Apps Script roadmap and a timeline when the new runtime engine will come in (which will make scripts run a lot faster). 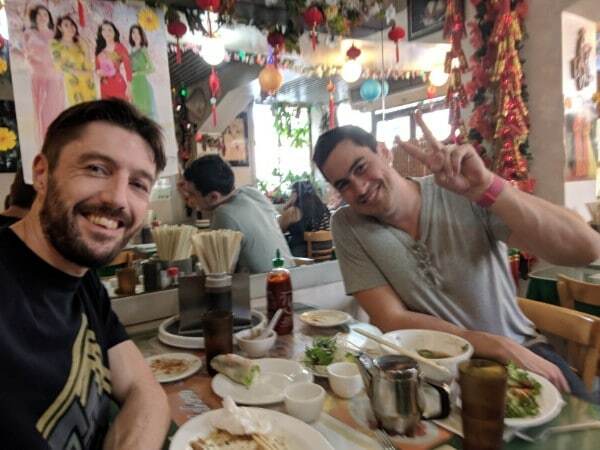 Lunch in Chinatown with David Siegel, CEO and co-founder of Glide Apps. 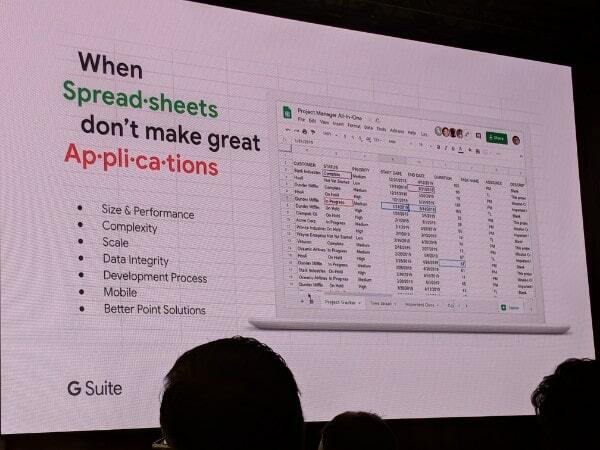 Glide Apps let you turn your Google Sheets into mobile apps, with no coding required. Here’s a quick example app built with Glide. 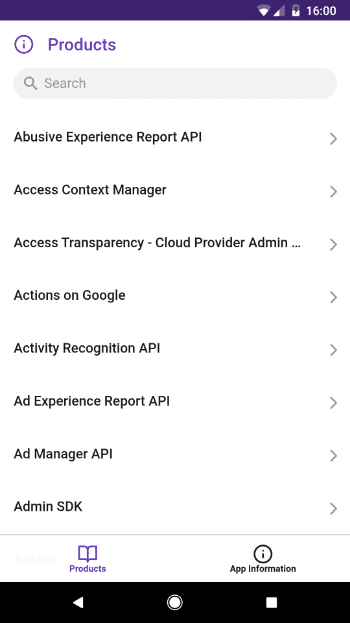 It’s a list of all the developer products that Google have. 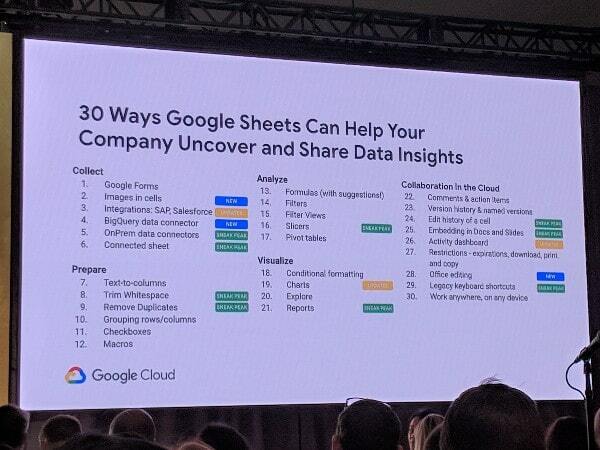 It’s imported into Google Sheets using IMPORTHTML functions to ensure that it’s dynamic and is synced with Google’s published list. The Next conference starts in earnest for me tomorrow (it’s the community summit today). The billboards all around the SOMA district of San Francisco are plastered with the conference ads. It’s crazy how big this event is. I’ve heard there’ll north of thirty thousand attendees. Wow! The Google Next 19 conference is almost here! 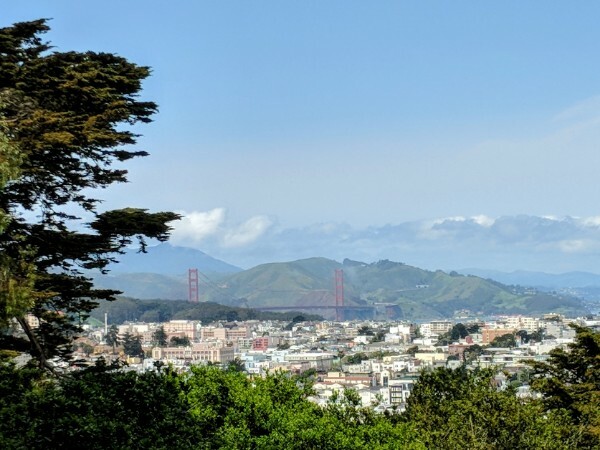 I’m really excited to catch up with friends, meet awesome new folks and hear all about the Google product road maps this week! 5 million cells ✔️ We got that earlier this year! Slicers 🚫 Not yet! They’re still in the works but I’m sure there’ll be an update this week! Better Charts ✔️ We got some nice upgrades like editing individual data points. There were a bunch of other upgrades and new features announced! 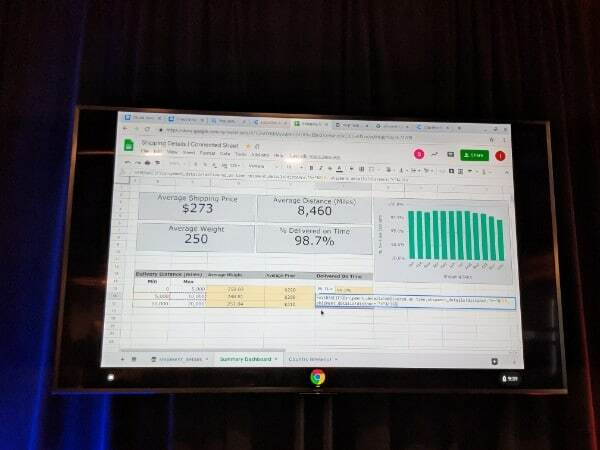 I’ll be sure to share the announcements from this year’s Google Sheets session here in this blog! 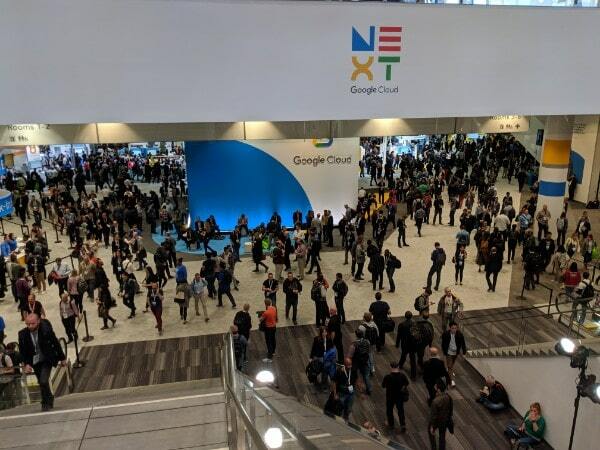 Google Next 19, the big annual conference from Google Cloud and G Suite, is just around the corner. It starts on Tuesday 9th April, although there are things happening on Sunday and Monday beforehand. I have my ticket and I’m flying to San Francisco on Sunday. I’m really excited! Last year was my first time at Next, and it was an eye-opening experience. With over 20,000 attendees and hundreds of talks, it was inspiring and overwhelming in equal measure. 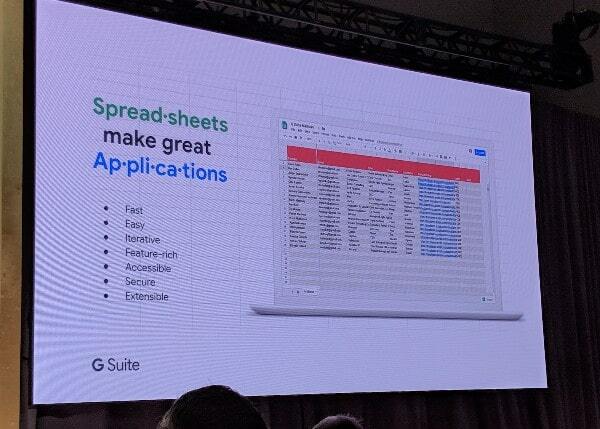 It was great to hear first-hand from the Google Sheets team on the roadmap, and I’m looking forward to new updates this year. This year, with experience from last year fresh in my mind, I’ve scheduled meetings ahead of time, been a little less ambitious with my schedule and packed a portable battery charger! My plan is to update this post daily with news and announcements from Next 19. 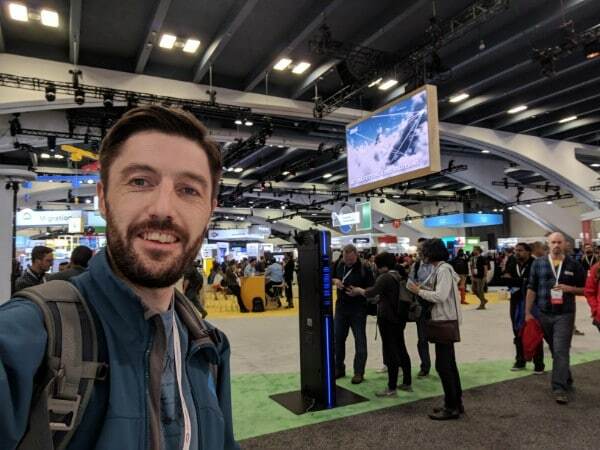 I’ll also be posting lots of updates to Twitter, under the #GoogleNext19 hashtag. Exciting updates! I just taught a General Assembly class this weekend where we did a lot of comparison of google sheets functionality vs Excel’s version. There is definitely lots of room to grow for Pivot Tables, Charts and Conditional formatting. Glad to hear they’re making progress on this front. Thanks for sharing, Ben! FYI: google ‘image()’ doesn’t work on iPhone or iPad. This would be nice to be consistent.